To play this event, you must command three personnel. 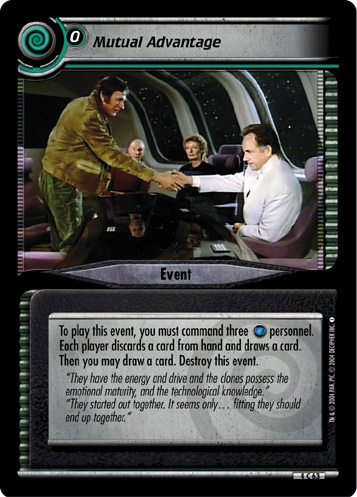 Each player discards a card from hand and draws a card. Then you may draw a card. Destroy this event. "They have the energy and drive and the clones possess the emotional maturity, and the technological knowledge." "They started out together. It seems only...fitting they should end up together." Characteristics: discard a card from hand, manipulate opponent's hand, additional card draws. There are 11 entries for Mutual Advantage (ST2E 4 C 63) at the Tradeplace (14 haves and 4 wants). Click here to see all trade list entries for this Common card! Also see here for all trade lists with any card fom "Necessary Evil".